WSJ.com: A month before boxers Floyd Mayweather and Manny Pacquiao even enter the ring, their May 2 title fight is already breaking records, with the pay-per-view bout set to cost fans $99 according to people close to the negotiations between the networks and TV distributors. 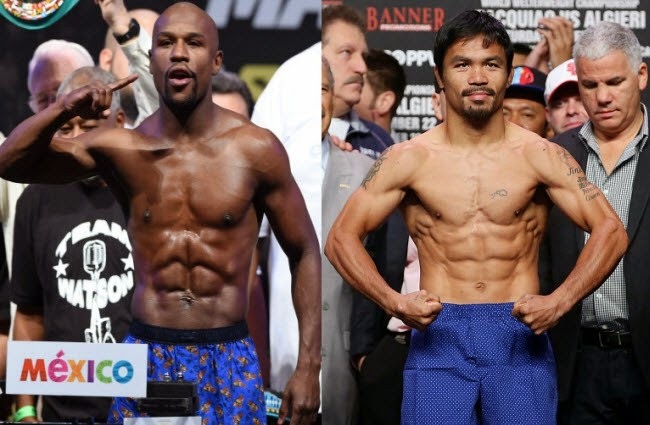 HBO and Showtime, which are handling negotiations for the camps of Mr. Pacquiao and Mr. Mayweather respectively, are expected to wrap up deals with major pay-TV distributors in the next few days for the highly anticipated welterweight title fight. The negotiations stalled last week as distributors and HBO and Showtime sparred over the split of what is expected to be record-setting pay-per-view revenue. Under the terms being discussed, the fight will be sold for $99 for a high-definition feed and $89 for standard definition, both of which are record prices. The previous high was $74.95 for high-definition and $64.95 for standard. Initially, pay TV distributors were asked to give up as much as 70% of the revenue instead of the usual 50% to 55%. That offer was quickly rejected. The tentative agreement now being hammered out will be less favorable to the distributors than the standard deal but not as drastic as the first offer, people with knowledge of the terms said. The final split will also be determined by the amount of marketing and promotions the various cable operators put into the fight. If certain incentives are met, the distributors have the potential to get 40% of the pay-per-view revenue. The key deals for HBO and Showtime are with iN Demand, which negotiates on behalf of Comcast Corp., Time Warner Cable Inc. and other large cable companies, and with DirecTV, the nation’s largest satellite TV operator with more than 20 million subscribers. The other distributors that HBO and Showtime will try to reach accords with are Dish Network and Vubiquity, which handles negotiations for AT&T Inc. and other distributors. Boxing enthusiasts have been waiting years for this fight and the popularity of Mr. Mayweather and Mr. Pacquiao is such that the bout is expected to be of interest to more than just the hard-core fan. Some industry observers have predicted that it could top three million pay-per-view purchases, which could amount to upward of $300 million. The current record is $152 million for Mr. Mayweather’s fight with Saul “Canelo” Alvarez. But with the fight only a month away, it is crucial to wrap up the pay-per-view deals quickly so distributors can start hawking the match to consumers.